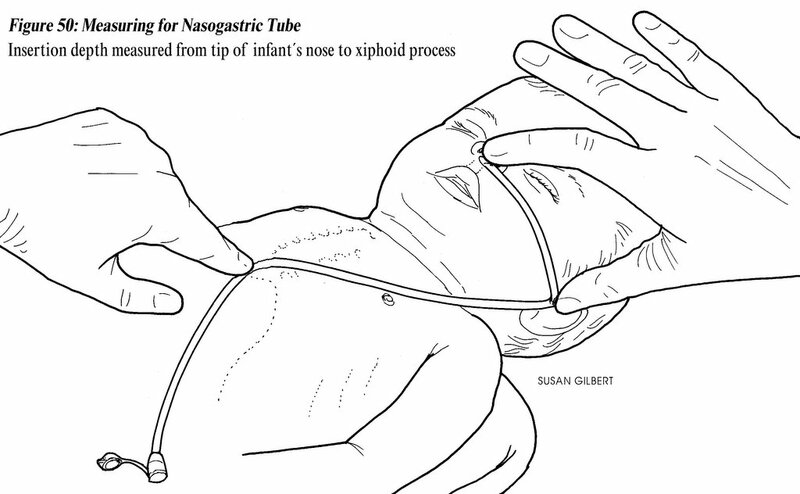 Clinical Notes: How to confirm a nasogastric tube (NGT) placement? By CXR or KUB? How to confirm a nasogastric tube (NGT) placement? By CXR or KUB? 65 yo CF has a new-onset dysphagia secondary to stroke. The speech therapist did a swallow evaluation and found out that the patient is at high risk for aspiration even with soft mechanical diet and honey-thick liquids. She recommended placing a fine-bore feeding tube, Isocal HN with a goal of 90 ml/hr and a repeat swallow evaluation in 3-4 days. The patient understands and agrees. You have just placed a Corpak tube and tested its postion by pushing 30 cc of air through the tube. How to confirm the nasogastric tube (NGT) placement? By CXR or KUB? NGT placement is confirmed by CXR. It is important to see that the NGT is below the diaphragm. One JAMA report concluded that the traditional physical examination-based methods of assessing proper NGT placement are inadequate when applied to the small-bore tubes (for example, Corpak). Only a CXR can assure placement in the stomach. Why not KUB? What are the complications of NGT placement? In 2000, a 78 year old patient died after she was fed through an NGT which was wrongly placed. The prosecutor case was that the junior doctor had been asked by nurses to look at an x-ray that would have shown that the tube was protruding into a lung and had given the go ahead for feeding to start. When the patient was fed, the food passed into her lung, and she died from acute pneumonia. (Source: BMJ 2003). Please note that KUB is an abdominal X-ray (AXR), but not all AXR are KUBs (source: Medline). NGT in right main bronchus. Report of KUB/Abdomen - portable: A Corpak feeding tube is in place with the tip extending into the right mainstem bronchus. The staff was aware and the feeding tube had been pulled. There is no bowel obstruction. This X-ray clearly shows why NGT placement should be confirmed with CXR. KUB almost missed the NGT tip. NGT is too high, in the esophagus and above the diaphragm, not in the stomach. 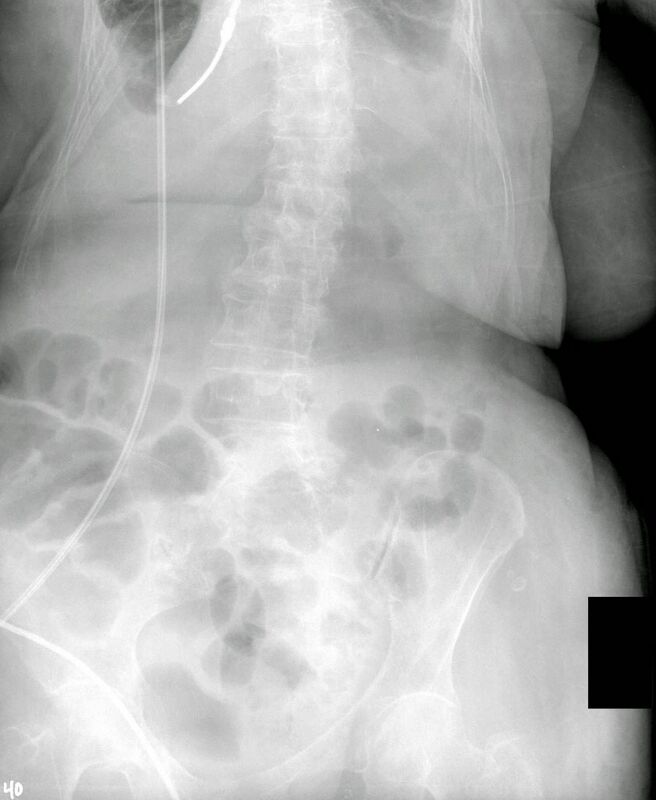 This placement is associated with high risk for aspiration. 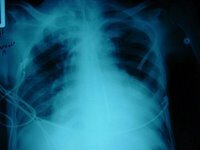 The NGT must be advanced further down and the new placement should be confirmed with a CXR. - Flex the neck a little. This is just the opposite of the neck extension which is essential for tracheal intubation. In NGT placement you want to avoid the tracheal intubation. This is the reason for flexing the neck. - Never force the NGT, it should go down smoothly. Ask the patient to swallow. If you are not sucessful in placing an NGT on the first attempt, do not despair. Ask somebody (a senior colleague) to help you. Even Dr. Genes, the founder of the online Grand Rounds, had trouble passing a NGT as an intern. Pneumothorax - An Uncommon Complication of a Common Procedure - nasogastric tube placement. NEJM, 07/2010. Nasogastric Intubation. NEJM Videos in Clinical Medicine.